The New York Times reports: The U.S. government is close to reopening. The Senate voted to reopen the government after 81 senators broke the filibuster that shut it down. Before the government can reopen, the House must approve the measure that the Senate passed. Monday morning, CNBC reported that Senators appeared optimistic they had the votes to end the government shutdown on Monday. The chamber is expected to vote Monday to advance a short-term stopgap bill to keep the government open through Feb. 8. “We will vote today to reopen the government," said Senate Minority Leader Chuck Schumer, D-N.Y.
Schumer said Democrats have received assurances that the Senate will take on immigration issues, before Feb. 8. 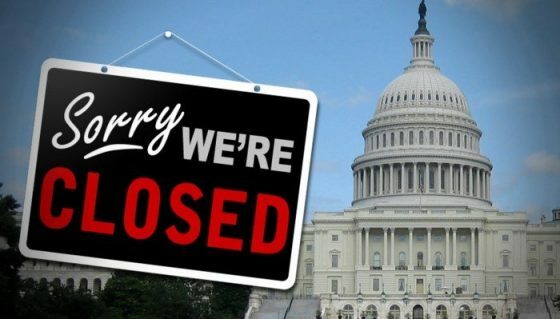 If it gets passed by Congress and signed, the funding legislation means that federal agencies will no longer be forced to shut their doors, and to furlough non-essential workers. U.S. government funding lapsed at the end of Friday. The Senate had aimed to vote on a procedural motion to advance the spending plan Monday. On Sunday night the Senate moved to hold a vote at 10 p.m. ET, but Senate Minority Leader Chuck Schumer, D., N.Y., objected. McConnell then scheduled a cloture vote for Monday. Once the measure clears the Senate, it would move to the House, where if it gets approved it would go to President Donald Trump’s desk. Negotiations around a three-week budget patch that included an extension of the Children’s Health Insurance Program (CHIP) and disaster relief funding failed to garner enough support for a Senate vote Sunday night, moving the government shutdown into this weekend. This caused worry for the future of CHIP, as House lawmakers on both sides of the aisle dig in their heels. Friday at midnight, a similar stop-gap spending bill failed to pass and government funding for a number of federal agencies' activities expired. That bill would have kept the government running until mid-February — one week longer than McConnell's new proposal -- and also extended CHIP for 6 years. A majority of Democrats refused to pass the bill. A handful of Republicans also opposed the legislation. A majority of Democrats refused to pass the bill without a fix for the Deferred Action for Childhood Arrivals (DACA) program that protects "Dreamers," undocumented immigrants who came to the country as children, from deportation. A handful of Republicans also opposed the legislation. But the Trump administration said Saturday it will not discuss the immigration issue until the government reopens. “We will not negotiate the status of 690,000 unlawful immigrants while hundreds of millions of taxpaying Americans including hundreds of thousands of our troops in uniform and border agents protecting our country are held hostage by Senate Democrats,” said Marc Short, White House director of legislative affairs, during a press briefing Saturday. Federal workers received notices Saturday placing them in one of three categories: exempt, "absolutely furloughed," and a middle category for employees who come to the office for a few hours, "to prepare for the lapse" and then leave. The OMB and White House have been reviewing the law to ensure that agencies whose “ ork is necessary to protect life and safety" remain open. For example, the CDC announced Saturday that it would continue "response work and surveillance" aimed at protecting Americans from seasonal influenza.